A belated Happy New Year to you all, were over half way through the month already, the years have just been flying by, far to quickly for my liking. It's a new year, which means lots of new ideas for the coming months.This year I want to develop and expand the ranges in bridal jewellery, to include bridesmaid jewellery sets in exciting colours and designs, that reflect the changing tastes of brides, who want to express their individual colour choices and style. I'll share with you all, a couple of the new bridal combs that I have already made. I've said in the past, how much I love pearls and crystals, both of which are my favorite beads to work with, when making my jewellery pieces. This bridal comb has been made with white faux glass beads and clear crystal faceted round beads and can be custom ordered, to match a brides chosen bridal colours. This one has been made with ivory glass pearl beads, the top row beads are slightly larger than the beads underneath them. The colour of the pearls can be changed to compliment the brides wedding colours. 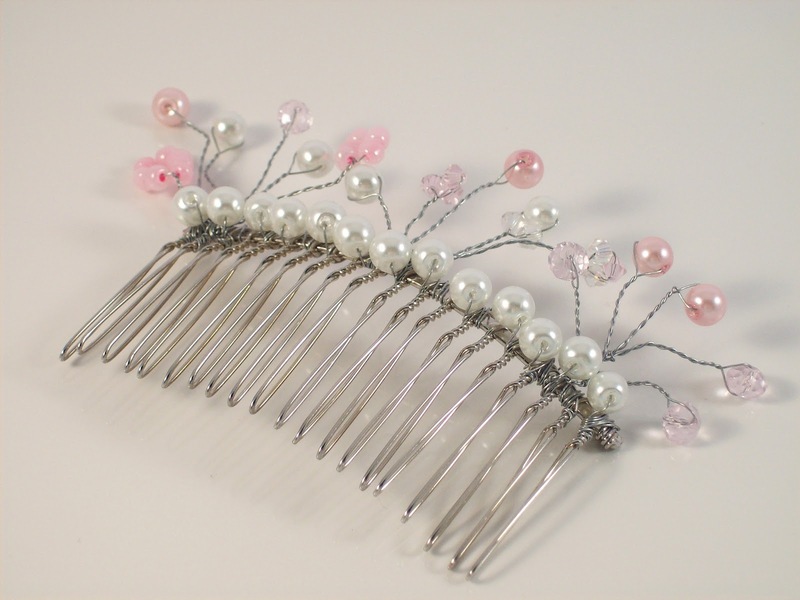 For this comb, I used small pink and white pearls and crystals, and they have been arranged to look like sprigs of flowers in the hair. Learning to make these bridal combs has been an enjoyable experience, I will be making some more combs, to add the collection. I've already started to make a tiara, I will be showing that on my blog, when it is completed. The combs and tiaras will be added to my shop, in the spring. All my jewellery is handmade and can be personalised, in your chosen wedding colours.